This meatloaf recipe is different than most. Moist, tender and flavorful. 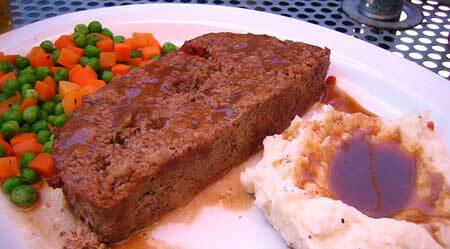 I don't like the dry dense variety of meatloaf. I like it to melt in my mouth and taste different than a hamburger. Ground beef recipes from sloppy joe, chili, hamburgers and meatballs can be healthy food recipes when you use 90/10 lean ground beef. That is especially true for meatloaf. And don't forget the all American leftover meatloaf sandwich. If your healthy food recipes don't include a meatloaf recipe, add this to your files. TIP: Food process vegetables, or mince so they disappear in meatloaf. You can also add ground pork (plain, unseasoned) to this recipe. Add 1/8-1/4 pound according to your taste preference. I prefer my meatloaf without pork. TO FREEZE: Shape into 4 individual size mini loaves. Freeze up to 4 months. To cook, thaw, top with tomato sauce and cook as directed below, except cut time. Check for doneness after 30 minutes. CALORIES: One fourth of this recipe equals 311 calories. Preheat oven to 350F. Lightly oil meatloaf pan. I use a cast iron skillet with a rack to let meatloaf drain while cooking. Mix all ingredients together. Mixture should be firm enough to hold it's shape, if you need to, add more bread crumbs. Pat and shape into loaf. Place in pan and top with extra ketchup. Alternate Topping: Spread tomato sauce or ketchup over meatloaf, sprinkle fine bread crumbs over top and drizzle 1 tablespoon of melted butter over bread crumbs. Bake for 45 minutes. Thermometer should read 160F. Turn heat to 500F to crisp top and sides for 5-10 more minutes, or place under the broiler for a couple minutes. Let meatloaf sit for at least 5 minutes before cutting to allow juices to reabsorb into recipe.